I love pizza – especially on the grill. There is something amazing that happens when you add the smoke of the BBQ to homemade pizza. When the weather gets hot, this is the way we make pizza at my house. I start with my homemade pizza crust (recipe here) and let everyone choose what toppings they want – it turns ordinary pizza night to an outdoor party! This combination is one of my favorites (I’ve written about my other favorite pizza here) – sweet and spicy BBQ sauce, crisp green peppers, onions, sweet pineapple and finished with 2 cheeses. Yummy! The following is the method rather than exact amounts. Add as much or as little of the below ingredients as you like! After the first rising of the dough – spread out on lightly greased double layer of aluminum foil. Add BBQ sauce, pepper, onion, chicken and pineapple. Grill over low heat until crust is crisp on the bottom and vegetables just begin to soften. Top with cheese and grill until cheese is melted and pizza is cooked through. Slice and serve! The thing I love most about pizza (besides the taste!) is that it’s a great way to use up leftovers. 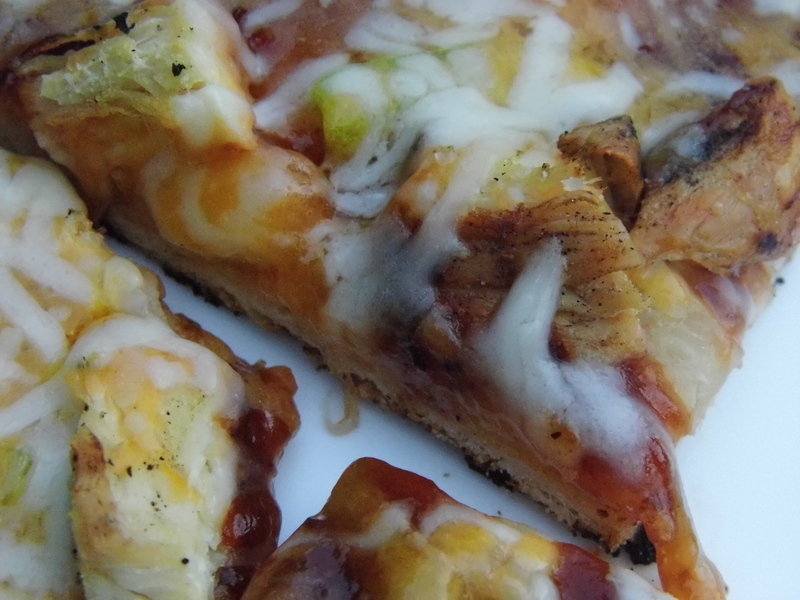 You can make just about anything into a pizza – your only limited by your imagination! It’s also much more affordable to make your own specialty pizza – especially when you use what you have on hand. What are your favorite pizzas? Do you like to make your own? I’d love to hear from you! I’ve never met a pizza I didn’t like, and this looks fantastic. We ended up grilling pizza a few years back during a power outage, It was basically born of desperation but we loved it and have been grilling them ever since. Going to try this one soon, thanks for the great recipe! Sure! I’m with you – I love all pizzas! And grilling them only makes it better! me and a friend grilled pizza many many moons ago when we went camping! Haven’t done it in a while ….the pizza that is…lol…..but now I’ve got a taste for it! I love it – especially since the weather is so hot, I don’t have to turn on my oven! My son brought over organic pizza dough that he made. more expensive than regular pizza dough. The pizza we made came out a little thick in the slice but when we made zeppoles with the same dough, they were out of this world. I have to try this! I’ve heard of making pizza on the grill, but never tried it before…sounds yummy! BTW, I made the rice-a-roni recipe the other night…SO good! I’m so glad you liked it! Must try the pizza – it’s super yummy! I haven’t tried grilling pizza, but I’ve been itching to! So, this is right up my alley! You’ll love it! It’s so easy! And the crust you get is unbeatable – nice and crisp. love it! May I reblog on my site? Grilled pizzas are wonderful. You are absolutely right. I love artichoke hearts and tomatoes on mine. Yummmy – we like those things too! Especially on a “white” pizza (with no sauce, just sliced tomatoes topped with olive oil and herbs and a little fresh grated romano cheese)! I think it would be just as good without cheese – sort of like BBQ chicken sandwich!